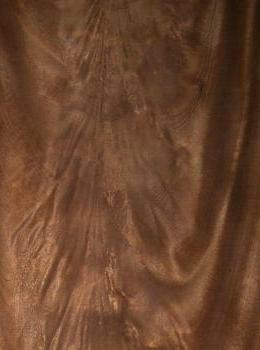 Burl and Crotch veneer can be very difficult to work with but spectacular when balance matched and finished properly. We have worked with many different burl and crotch woods over the years for a variety of applications. It takes patience and foresight to work with these cuts of wood. I do not recommend using paper backed burl and crotch wood for the construction of anything especially heirloom furnishings. I recommend pressing the single ply sketch faces to cross banded substrat in all cases. Crotch and Burl woods are expensive and becoming even more so, so it should be pressed with care and for durability and longevity. These veneers are thin, expensive and the waste factor can be great so don't cut yourself short when your buying these cuts of wood. Laurel grows between the 36th and 47th parallels along the Chilean coastline. It grows in the plains and only in the lower mountain regions up to a maximum altitude of approximately 2100 feet. Laurel trees can be large, reaching heights up to 120 feet and 6 feet in diameter. 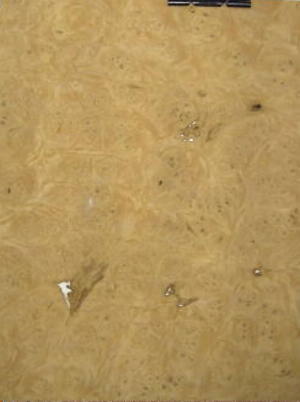 Burl is rare and therefore, is sought after, especially when it displays a dominant light yellow color. Besides being popular for architectural interior work and fine furniture, it has also found its way into the dashboard world along with several other species. I like this wood and wonder why it doesn't get used more often. Laurel Burl will be used as a substitute for lighter tones of Myrtle Burl. Myrtle Burl is attractive but does not typically display the dense tight eye clusters that Laurel does. Carpathian Elm Burl comes from the Carpathian mountians, in France. 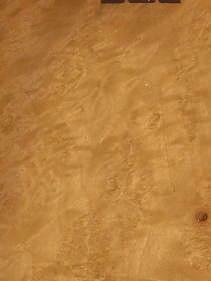 It is a rich looking wood varying in color from pale pinkish to white with brown or black pecking and cluster markings. A Burl originates from a growth or disease, such as Dutch Elm Disease, which can cause clusters,dormant rings and eyes with a swirl grain or muscle surrounding the Burl. 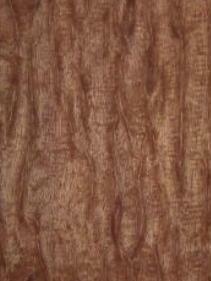 Burls in general are highly prized for veneer production. Elm Burl veneer is typically used in high quality architectural wood working, high class furniture, automobile interiors and as accents and inlays. We typically have Carpathian Elm Burl in inventory and one of the more popular Burls. Over the years we have done a lot of Elm Burl work. Crotch Mahogany is either Khaya (African Mahogany) or South American Mahogany. Khaya typically yields larger Crotch than South American Mahogany. South American Mahogany Crotch is very hard to come by for a variety of reasons. The term Crotch comes from where a limb separates from the main trunk of the tree or the trunk splits. Its outer grain tends to have a feather like appearance and is typically used in the reverse of the way it actually grows. Keep in mind that Crotch Mahogany is expensive and I do not believe that it should ever be used as paper back. Paper back veneer gets its flexibility from being tenderized. Tenderizing breaks the wood grain and its bond to the paper backing. If you use contact cement to glue Burl, Crotch or any other wood veneer to any surface, you will most likely experience adhesion failure. You can tell when this is happening because the veneer face will have puckered fractures. Since Crotch has both a hard rat tail heart grain, and a softer outer feather grain, it can move a lot and should be treated with great care when being pressed. It should not be paper backed and flexed because I feel that it is a waste of heirloom quality wood at best. Maple Burl is another Burl that is the product of cambium. Maple Burl is common to hard Maple, just more common to soft Maple. Hard Maple tends to have cream to white sapwood and a light reddish brown heartstock. Hard Maple is where birds eye comes from along with some curly and of course burl. Soft Maple trees tend to be very similar to hard Maples just much lighter in density. Soft Maple sapwood can be very white and the heartwood is tan to grey in color. 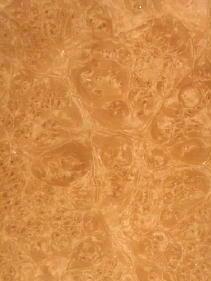 Soft Maple can produce some very attractive spalting along with curl, cluster and angel wing, quilt and burl. Maple is one of the hardest woods to produce without staining. It has a tendency to stain rapidly and therefore is typically dried emmediately after being cut or sliced. Most wood workers are very familiar with the various colors that Maple can display. 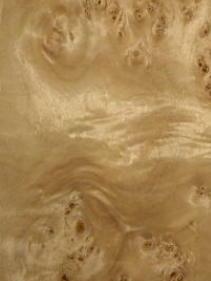 We have Maple burl that is very pink, sort of rust colored and pretty white. Bark pockets are common to Maple Burl and large plates usually have odd shapes and or bark pockets right where most of us wish they weren't. So keep in mind that large waste factors are very common when you are balance matching Burl. Mappa Burl is the burl of the European black poplar tree. 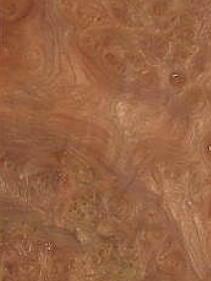 One plus for Mappa Burl is that the plate sizes are typically large. It is one of only a couple burls that have large plates on a consistant basis. I would say that it has the largest plates on average though. The down side is the holes that it frequently has. I do not really care for working with mappa that has lots of open pecking. It can be very hard to get a good joining edge as well as dealing with small knots falling out regularly. I have a tendency to pick out Mappa that is much more sound and has a lot of muscle. 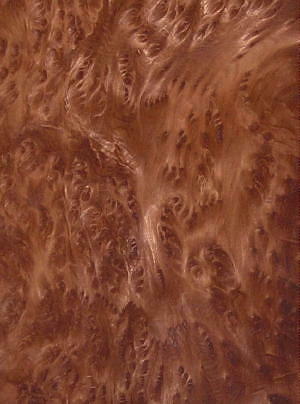 We will dye our glue in order to get it to mimmic the color of the small dark burl eyes that are common to Mappa Burl. Italian Poplar, European black poplar and black Italian poplar are all the same. There are four branches of poplar black, white, trembling and balsam. We sell dyed poplar and usually have some plain sliced poplar around too. We actually use more Okoume than Poplar these days. When you purchase a Myrtle Burl/Burr flitch you get some bundles that look like the colors you get in a root beer float. Other bundles will look more like french vanilla and then there are the bundles that are green and brown with dark burl eyes and maybe a little french vanilla sprinkled in for good measure. Myrtle long wood is much the same when it comes to color. This is a West coast wood. I am told that it is not unusual for a Myrtle tree to have many burls scattered up and down its trunk. It seems that we go through hot and cold phases with most burls in that they rotate in popularity. These days with the car market being as depressed as it is, the burl market in general is down. We do have a good Myrtle burl in inventory and the plates are good sized so don't hesitate to ask about. 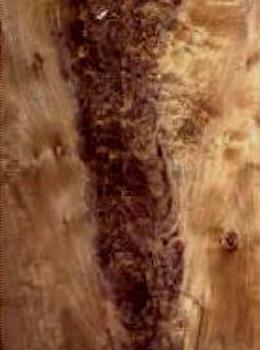 The swollen tissue at the base of some redwood trees is typically known as "burl". Scientifically it is known as a lignotuber, which basically means "swollen wood". All redwood trees have lignotuber tissue but not all have large visible burls. Lignotubers are responsible for vegetative (clonal) reproduction that is common in redwoods. If it weren't for this mode of propagation, the redwood forest would appear far different than it does currently. The second and third - growth redwoods in our coastel forests were generated vegetatively after the 19th and 20th century logging of the original forests. If redwoods were solely dependent on reproduction from seed, their numbers would only be a small fraction of what we see today. There is a growing black market for redwood burl along with many other burls. They are obtained illegally from healthy trees on protected forestland. In some cases, removing burl can kill a tree or, at least, deface it and reduce its reproductive potential. There is nothing wrong with questioning the source of any wood that we buy or, that you may buy from us. If you wish to learn more about redwoods and how you can help protect them go to:http://www.sempervirens.org/doctor.htm. 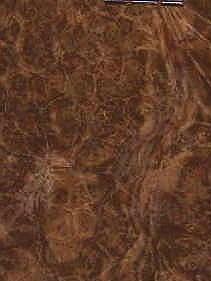 We do keep some redwood burl in stock and from time to time we also have redwood longwood. You basically get two looks with redwood burl, strong eye (pecking) and, swirl with more muscle and less eye. Snail track Mahogany is fairly rare and I think it may have to be described as super intense plumb pudding. The veneer that we have in inventory came from a South American Mahogany buttress root. We have snail track (caracolio), plumb pudding and a series of bundles with a very unusual super tight grain pattern. The color is that really nice traditional deep rich reddish brown tone that Honduran Mahogany is known for. The bundles are not huge but good sized for furniture. We have another sequence that has panel length plumb pudding in it as well. Walnut Burl is probably the most popular wood burl of all burls. Not bad for being a large knot, like a lump, on the side of a tree. Burls can be worth alot of money and Walnut is no exception. As we know, Burls are the result of cambium. Nice burls are rare and becoming even more so. It is thought that burls and figured wood in general are the result of stress. Just exactly what all the different types of stress may be, I'm not sure we have determined yet. There are 21 species of Walnut in the genus. They range across the north temperate Old World from southeast Europe, east to Japan, and more widely in the New World from southeast Canada, west to California and south to Argentina. Some of the species, such as Persian Walnut, are popular for their fruit where others, like Black Walnut, are popular for their wood. Black Walnut Burl is probably my favorite burl to work with. When we work with Walnut Burl, we balance match to the cut to size panel or sketch face so we can realize the full affect that burl has to offer. We use Walnut Burl for matched wall panels, cabinet component parts, table and desk tops and various types of furnishings. We typically have Walnut Burl in our inventory and we enjoy working with it. As we all know, crotch Walnut is created where a branch intersects with a tree's trunk and/or when there is a double trunk. Wood fibers weave together to strengthen the limbs or branch involved forming the crotch and feather appearance. The term feather is used because the pattern created by this natural process resembles a feather. The term rat tail is sometimes used to describe the heart of crotch wood nearest to the center of the trunk. As the crotch works its way to the outer edges of a tree trunk, its heart widens, eventually turning into swirl. Keep in mind that when used in an architectural application, the appearance of crotch is upside down from the way it's actually formed. Bark pockets that interupt its sequence are common in Walnut crotch. So, what may have started out as a 4-foot long crotch, can easily end up as a 20-inch crotch with perhaps a 10-inch crotch on the other end of the bark pocket. This is just one scenario that helps push up the price of Walnut crotch. A mill pays for a certain amount of cubic footage, doesn't get it and then has to do additional clipping in order to grade, which can add to their investment and the retail price. Need I say, that nice Walnut crotch is getting expensive, but worth it? We have a large Walnut crotch in stock.